The clip features the guitarist and his band – vocalist Myles Kennedy, drummer Brent Fitz, bassist Todd Kerns and guitarist Frank Sidoris – in the studio and at a photo shoot as they prepare for the September 21 release of the Guns N’ Roses guitarist’s fourth solo album. 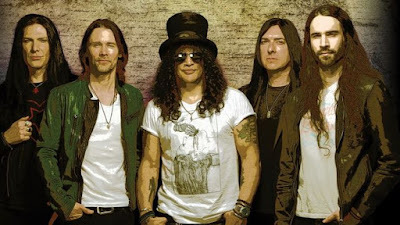 Slash worked on “Living The Dream” with producer Michael “Elvis” Baskette (Alter Bridge, Iggy Pop, Incubus), who previously teamed up on 2014’s “World On Fire”, which debuted and peaked at No. 10 on the US Billboard 200. The group will launch ”Living The Dream” with a month-long fall tour of North America that will begin at the Whisky A Go Go in Los Angeles on September 13. The solo shows come during a break in Guns N’ Roses’ Not In This Lifetime tour; now in its third year, the trek will resume this fall with dates across Asia.